Niantic is slowly rolling out Pokémon from Hoenn region, and the new update puts 23 Gen 3 Pokémon into Pokémon Go . 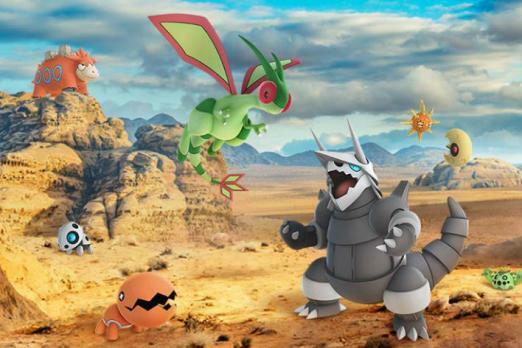 The latest update went live today, and here’s all the information you need to know about the new Pokémon added to Pokémon Go. The Whismur line are a trio of Normal-type Pokémon that use sound waves to attack. You can catch Whismur in the wild and evolve it into its middle evolution with only 12 Whismur Candy. To evolve Loudred to Exploud will take 100 Whismur Candy. One of the strongest lines in the Hoenn Region, Aron and its Shiny form can be caught in the wild. Aron will evolve into Lairon after 25 Aron Candy and the powerful Aggron after 100 Aron Candy. Numel can be caught in the wild and evolves into Camerupt with 50 Numel candy. What’s Wurmple’s Deal in Pokémon Go? Cacnea can be caught in the wild and evolve into the Grass and Dark-type Cacturne after using 50 Cacnea Candy. Trapinch and the rest of its evolution line are among the most beloved Pokémon in the entire franchise, not just the Hoenn Region. The small Ground-type Pokémon can evolve into Vibrava after using 25 Trapinch candy and into Flygon after 100 candy. Nosepass can be caught in the wild. but doesn’t have any evolve form.You may want to stock up on this Rock-type Pokémon for Gen 4. Redditors report Torkoal spawning in India, but Niantic hasn’t offered official confirmation confirmation. We will update as soon as we learn more. The Ground and Psychic-type Baltoy can be caught in the wild and evolve into the more powerful Claydol after 50 Baltoy Candy. The Fossil Pokémon of the Hoenn Region, Lileep and Anorith can be caught in the wild. Both need 50 of their respective candies to evolve Lileep into Cradily and Anorith into Armaldo. Which Pokémon have you caught in the latest Pokémon Go update? Let us know in the comments section below.